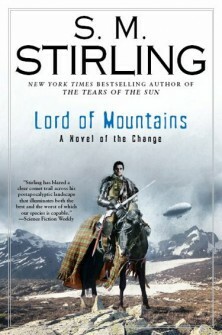 Lord of Mountains is S. M. Stirling's ninth novel of the Change, a series that began with Dies the Fire. It is the shortest of the nine novels, and if it weren't for the other eight, it would not be as satisfying. Since I have read the other eight, I can say that I enjoyed this novel for its tying loose ends together--and tolerated it for a novel whose very first word was written to fulfill that very same task. The Change occurred when an electrical storm centered over the island of Nantucket produced a blinding white flash that rendered all electronic devices and firearms inoperable--and plunged the world into a dark age humanity was unprepared to face . . . What happens when the lights go out . . . for good? The series follows several groups of people in the Pacific Northwest who survive the inevitable catastrophic changes that follow a technological society's loss of technology world-wide. Lord of Mountains provides closure for the characters and cultures that have developed during the course of the first eight novels. Stirling's website mentions "There will be 3 more "Emberverse" novels after The Given Sacrifice, probably set a generation later." Dies the Fire, The Protector's War, and A Meeting at Corvallis chronicle the first generation, those who witness the Change and establish the first enclaves of survival in the massive downfall of civilization when the plug is well and truly pulled. The Sunrise Lands, The Scourge of God, The Sword of the Lady, The High King of Montival, The Tears of the Sun, and Lord of Mountains document the "changling" generation twenty-five years after the Change. This series will apparently be completed by the forthcoming novel The Given Sacrifice. The second generation after the change--let's say fifty years after the Change--will be the focus of Stirling's next three books. What I like about these books are anthropological insights that Stirling develops as he follows the men and women who struggle to redefine life in a time much different, in a time in which "modern" means seriously retro. Stirling's thread of speculation is thorough and creative, leading to many moments of pleasure and humor. His vision leads from an engineer pondering science fictional questions regarding the Change to mythic and fantastic (in the true sense of the word) possibilities being resurrected from legend. What I don't like about the series is that a great deal of head-bashing fills the series, ending with truly epic battle in Lord of Mountains. Stirling does it well, providing gritty detail, not wallowing in the gore yet still hosing the reader with all the crimson realism an aficionado could desire. For me, character development and the variety of cross-culture characters balanced the battle gore. For some it will not. Stirling's epic vision extends beyond man, and this provides some moments of enjoyable head-scratching. Not to lean toward anything resembling a spoiler, here is a basic question: If energy and its lack can be personified in some way, how would this play out? Stirling tackles this idea and presents some possibilities that are both reassuringly predictable and also refreshingly original. I'm looking forward to The Given Sacrifice, if only to provide a substantive firewall at the close of the series. The title, though, reminds me a little of Thomas Mann's Death in Venice. It sort of limits speculation. For those of you interested in fan fiction based on Stirling's universe, try Kier Salmon's website. This is an excellent review. You tell us enough about this new dystopia in order for us to imagine it, but not enough to make us live in it. However, your enthusiasm for this bleak world that Stirling has created (I'm taking your word for it, not having read Stirling) brings cinematic thoughts to my mind. Stirling wrote The Terminator series, from which the movies are based. If you are motivated to read one of the series, I'd suggest beginning with Dies the Fire. Thanks for liking the review. He wrote novels based on the Terminator movies, not the other way around. Thanks! Didn't know that, but I noticed some of the titles were different.